Furukawa Rock Drill USA, a subsidiary of Furukawa Rock Drill Co. LTD, specializes in Breaker and Rock Drill manufacturing. 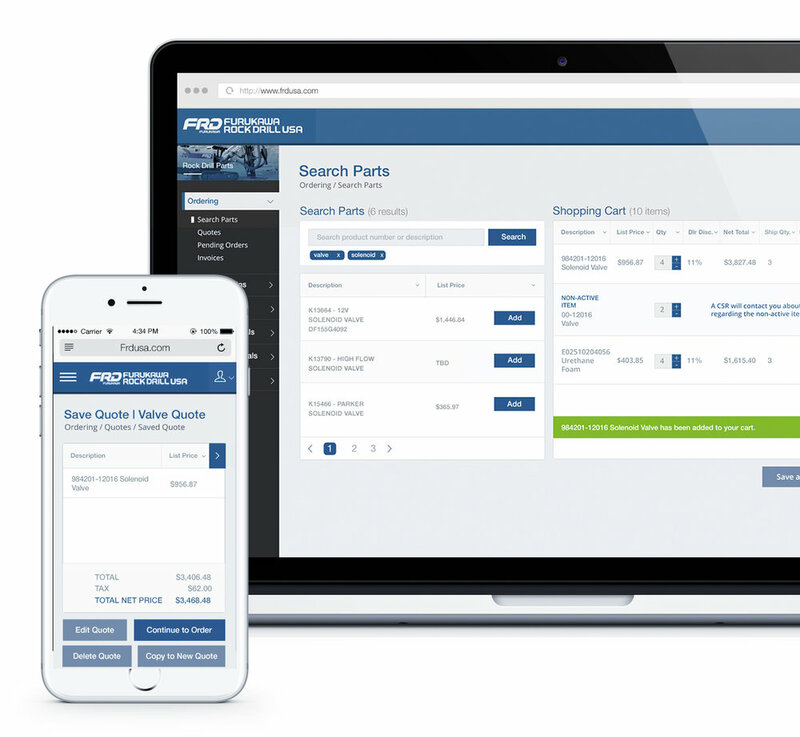 In order to simplify their parts ordering process, the FRD USA team asked Level Seven to create an online dealer portal and ordering system for Breaker and Rock Drill parts. In order to create this system, we had to create a point-to-point VPN connection between FRD USA’s Amazon Web Services account and their on-premise Dynamics NAV server in order for users to be able to successfully create orders. We also had to establish a notification protocol that would be used throughout the application for all customer interactions; these interactions include shipping notification, order changes, backorder inventory, user registration confirmation, password change notification, and all other necessary email communications. After the initial development setup, we created wireframes and designs that defined how a user would navigate between the pages of the portal. These designs also laid out the general workflow for parts search and placing an order. Once the design and workflow processes were finalized, we then implemented the design, as well as built the backend user quoting, ordering and payment processes. We also created functionality that allowed users to complete sales, returns, and warranty forms, simplifying the user process for submitting and tracking warranty and returns. Functionality that allowed user to search for specific bulletins and where specific part numbers were used was created, as well. The online dealer portal and ordering system was recently launched for use by Rock Drill and Breaker customers. Since launch, many of FRD USA’s customers have utilized the online ordering system, simplifying their ordering, payment, and tracking processes, increasing the efficiency and efficacy of their ordering process.